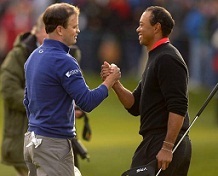 In the final individual stroke play tournament of the season (non-official) Tiger Woods and Zach Johnson were tied going into the final hole on Sunday. Woods began the day with a two-shot lead looking for his sixth World Challenge title (for which he is the host). Johnson misjudged his approach shot into the 18th and it wound up in the water. Woods didn’t exactly knock down the flag, leaving it right and in the bunker. Hitting his fourth shot from the drop area from about 70 yards, Johnson stepped up, fired at the pin, and knocked it in the hole. You know, your routine par. Woods then had to get it up-and-down from the sand which was not an easy shot by any means. He was able to convert on the par attempt and send the tournament into extra holes. That, unfortunately would be the highlight of the playoff. Johnson missed a birdie putt on the first hole of sudden-death to win the tournament. Woods stepped up and needed to knock in his short par attempt to extend the playoff. Inexplicably, Woods pulled it left and missed. Johnson won, but the expression on his face was that of disappointment rather than joy as his first reaction. No one really enjoys winning that way. But if you look back at the shot in regulation that got Johnson there, it’s one of the craziest finishes you will ever see in a golfing event. If anything, the tournament certainly left fans of golf wanting more, with the fact that there won’t be a PGA Tour event until January now when the 2014 schedule begins in Hawaii at the Tournament of Champions. Of course, one of the underlying aspects of this tournament was the fact that Woods blew a 54-hole lead at his own event for the second time in four years. He lost both of those tournaments in a playoff. His weekend rounds were a far cry from the blazing 62 he fired on Friday to get the lead. While he didn’t play poorly on Saturday and Sunday, he definitely had opportunities to go run and hide from the rest of the field. It’s a theme on the weekend that has plagued Woods in the big events over the last couple of years, especially in the Majors. Woods used to be a sure thing with a weekend lead. And while that is still the case for the majority of the time, it now makes things even more interesting to see if he can hold on.